Our new baby arrived last Friday all shiny, new and decked out in Graphic Whizard colours and logos. It is a 24 foot trailer powered by its own generator and is currently in the Graphic Whizard parking lot getting outfitted. 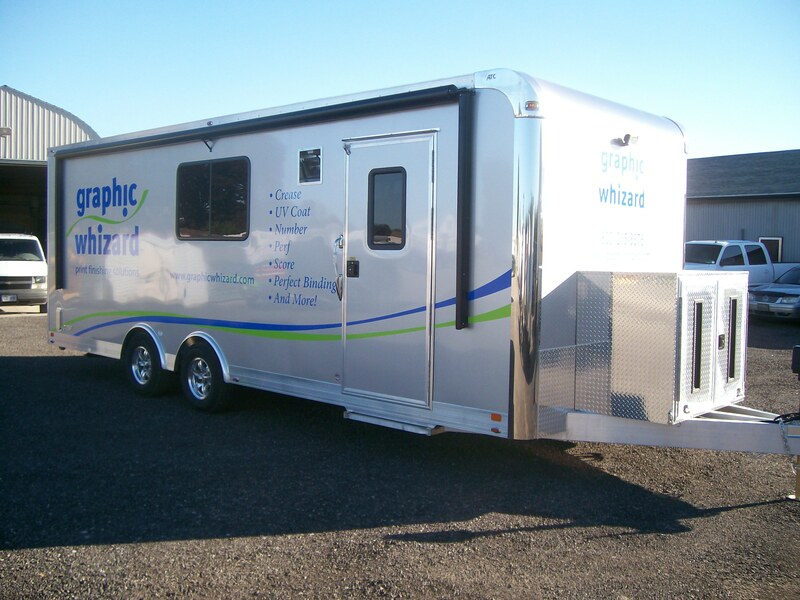 We are installing 8 machines from the Graphic Whizard line-up in this new mobile showroom and it will be heading out on the open road for its inaugural trip next week. First stop is Offtech of New England’s annual Octoberfest Open House. Everyone here at G-Whiz is pretty excited and we have all been popping our noses in the showroom door to check out what has been added. I heard the generator humming yesterday and took a peek myself; Jeff was testing a CreaseMaster. This new baby will be taking the tried and true of the Graphic Whizard product line as well as the latest and greatest such as the new PT-SCC, slitter/cutter/creaser. We can’t wait to show this new addition off and look forward to visiting all our dealers in North America with this great new showroom on wheels. Stay tuned for some pictures to be posted later this week.